Photo by Mike Briggs - He RULES!!! Once again, it's time for the Month of Mud. Not only is this series 25+ years old, it's been home for regional off-road unicycle racing since 2008. Since then we've been welcomed. This year things are a bit different. We've got an official uni class. Now that we've got the dates established, let me explain why this is a big deal. 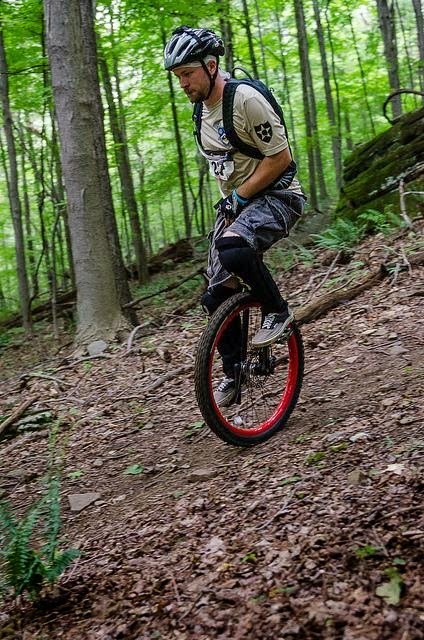 Outside of unicycling conventions such as NAUCC (the North American Unicycling Championships and Convention) and Unicon there aren't a whole lot of races that have official unicycling classes. (Around here, we're lucky to have 2: The Fat Tire Challenge, and 6 Hours of Brady's Run.) When you throw in the word Series, the number shrinks to nearly none. Once again, the Month of Mud comes through. If we have 5 or more riders per race, we've got the class. While racing isn't all unicycling is about, it's important that it exists. Competition pushes riders to best themselves. It pushes the sport forward as not only is unicycling for performing, but it's also an intense athletic endeavor that happens outside. For us, partnering with bikes makes sense. One of the reasons partnering with the Month of Mud makes sense for us is that the races are already a reasonable length. The series is not only a place for the local fast folks to have a run at it, it's a gateway series for many riders. 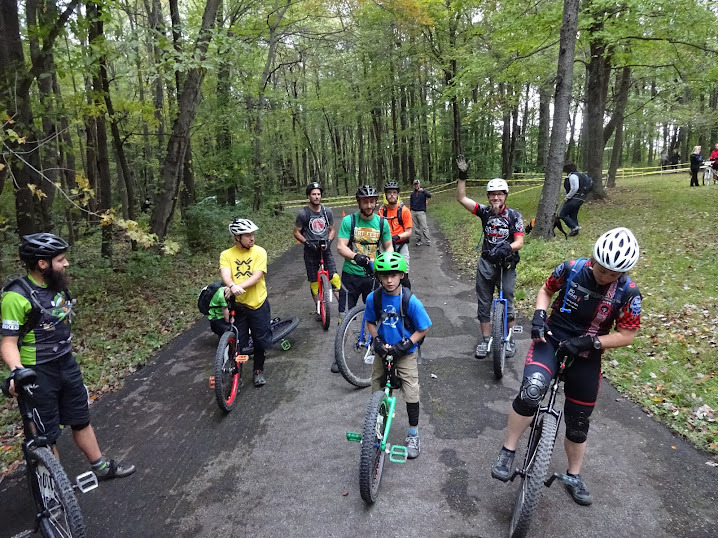 The races are family friendly with the courses at the beginner (and uni) level designed to be relatively short- 10mi or less vs. the 15+ mile races that are common to mountain biking. They were originally designed so that people could race in the morning and be home in time for the Steeler game. Another major reason for partnering- we've already got experience working together. The Month of Mud has played an important role in moving off-road unicycling forward already. The NAUCC 2013 Muni course was at Moraine, the site of many excellent MoM races. We drafted a bunch of our local MoM regulars to help make Moraine Muni a success. Moraine is challenging terrain, and it opened the eyes of some (both riders and spectators) to what unis can do. Without MoM Cyclocross, specifically Matt Tinkey, it may have been years before Unicycle Cyclocross happened at the National and International levels. Since his work in debuting it at NAUCC it's become a regular event at NAUCC, and now Unicon. Around here we knew unicycles and cyclocross made sense, but it took the efforts of locals to bring it to the worldwide stage. So this year, it makes sense we keep pushing forward. With a series, it encourages multiple days of racing. It hopefully attracts riders who haven't ridden the series before. Having prizes (other than medals) in unicycling is rare. The Wheel Mill has been excellent in this arena with 2 uni contests this past Winter. Having prizes at the conclusion of the series will also hopefully attract riders. Join us. If you're unsure of your abilities, it should be noted that Cyclocross is for EVERYONE who can ride a uni and freemount. The Cross Country and Super D races require some technical ability and a level of fitness to ride several miles of single track trails. Registration isn't up just yet, but when it is we'll disclose the details. For now, consider making it to one or more of the races and collecting some High 5s from local unicyclists and bikers. The Month of Mud is packed full of awesome people.